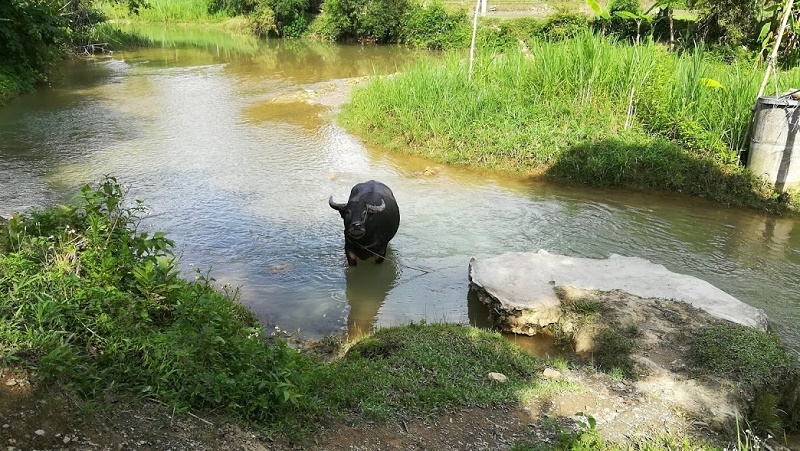 The isolated regions of the far north of Vietnam have retained a wild beauty and rugged charm that have been lost in many areas. 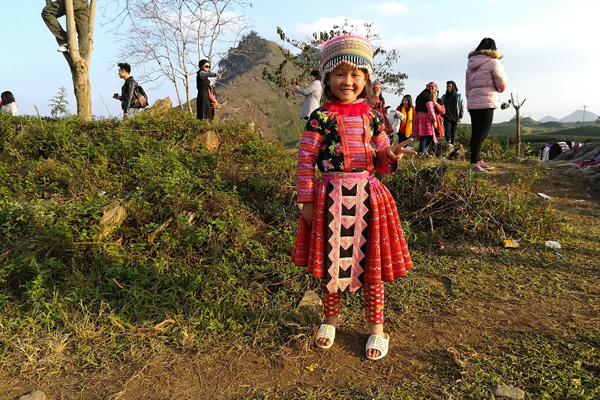 This ultimate experience in the northeast of Vietnam will take you into the heart of the countryside to discover the incredible landscapes and ethnic minority communities. You will visit many remote areas of unspoilt beauty, taking in the incredible vistas along the way. Pick up from airport and transfer to Hanoi centre for Lunch. Your guide and driver will collect you from your hotel in Hanoi. The journey begins as you leave the town and pass through the undulating terrain of tea plantations and villages which line the roads. 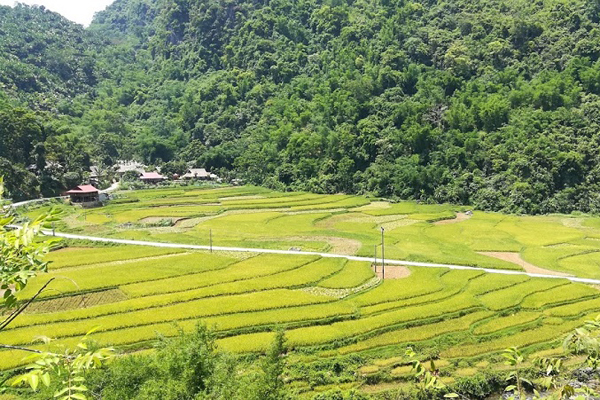 This is your first glimpse of rural Vietnam and sets the tone for the days ahead. Depending on the road and traffic conditions the drive, you will arrive in Ba Be in the mid to late afternoon. After checking into Mr Linh’s Homestay, you will have some free time to walk around or simply relax by the lake. The national park of Ba Be is centred around the vast waters of Ba Be Lake. This is just one continuous water body, although its name means three lakes, and it is technically made up of three smaller lakes. Today, you will take a boat trip around the lake, the best way to uncover the beauty of the park. 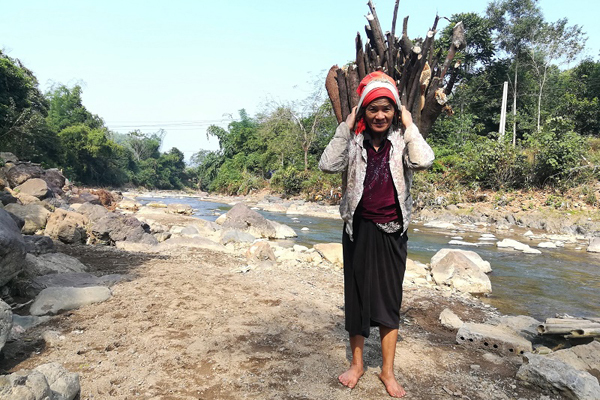 Along the way, you will stopover at some hill tribe villages before heading to the Dau Dang Waterfall. After a short walk down to the waterfall, you will start the trek to Na Hang Lake, stopping for lunch on the way. After lunch, you will once again board the boat to cruise along the river to Bac Me, where you will be collected by your driver for the journey to Ha Giang. 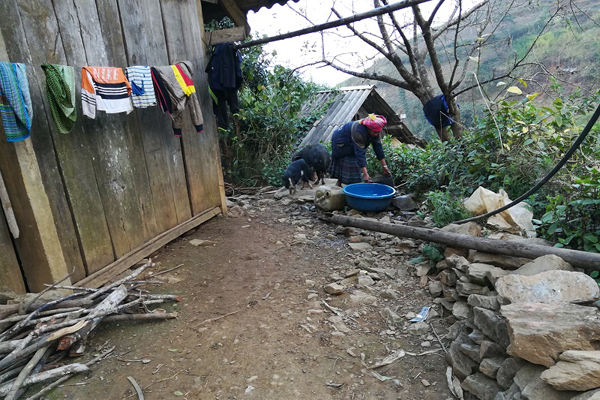 You will have dinner and stay overnight in a homestay in Ha Giang. 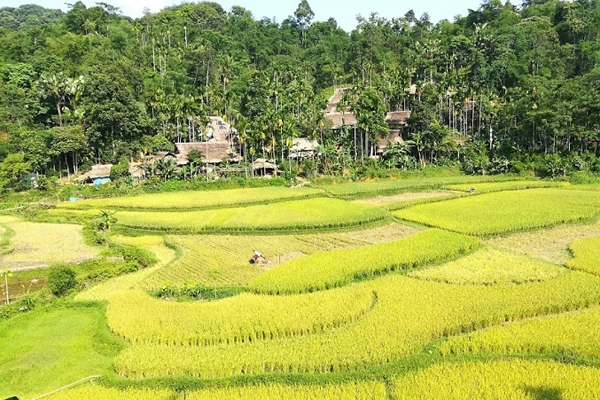 Today you will trek through the amazing landscapes for approximately five-six hours to Nam Hong Village. Along the way, you can drink in the stunning vistas of rice terraces, mountains and bamboo forests. You will also likely meet local people from the many different ethnic minority communities in the areas such as the Man and Ta Pan Dao. 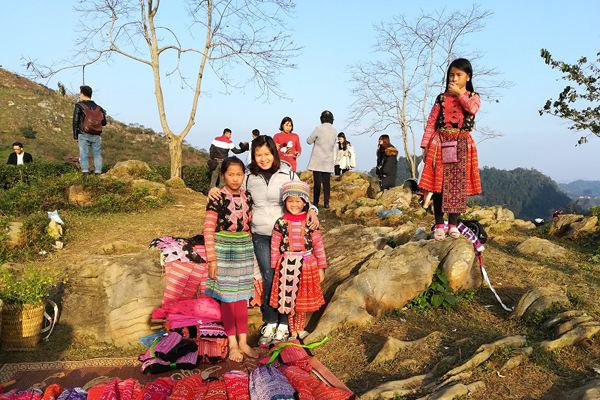 You will have a picnic lunch and continue the journey to the remote village of Ta Pan Man. En route, you can see farmers working in the fields and there may be the opportunity to experience some their work first hand. You will return to the homestay for dinner and stay overnight in the village. 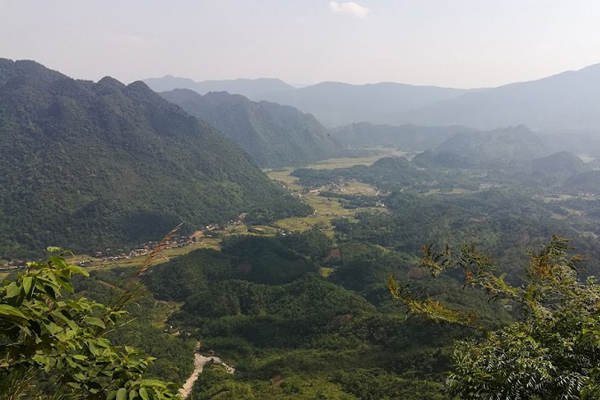 As the area is under military control, you will have to buy a travel permit in Ha Giang which your guide will assist you with. Then, you will take to the road along a series of dizzying and dramatic passes to Dong Van. 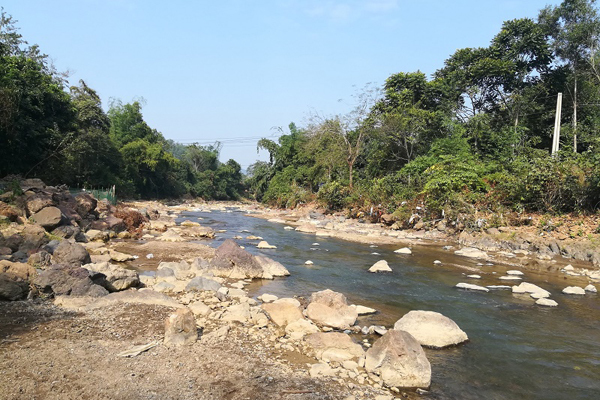 You will stop along the way for lunch in the small mountain town of Tam Son. Then, you will pass through a tall forest of pine trees to visit the Hmong King's Palace. It was built by Vuong Chinh Duc who was in alliance with the French. You will arrive in Dong Van at around 18:00. You will have dinner at local restaurant and stay overnight in a hotel. After breakfast, if it is a Sunday, you can visit Dong Van Market where people from the surrounding villages meet to trade and sell fresh produce and homemade goods. After, you will visit the French fortress, Pu Lo. It was built in 1980 and occupied until 1945 and has been well preserved since that time. 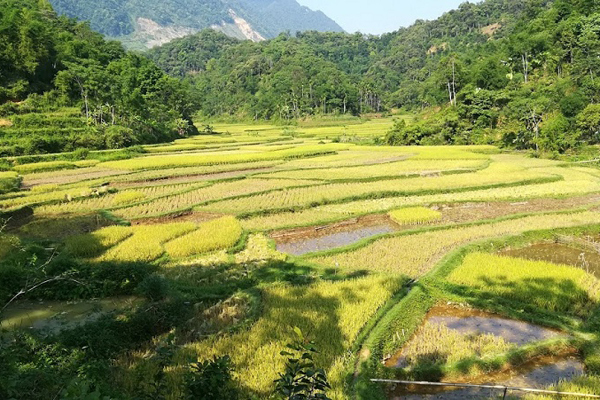 You will then travel along the spectacular Ma Pi Leng Pass which, at a height of 2000 meters, offers some of the best views over the valleys, rice paddies and hemp fields. You will then follow the road down into the valley of Meo Vac before travelling to Bao Lac for lunch. After lunch, you will travel to Cao Bang where you will spend the night in a hotel. 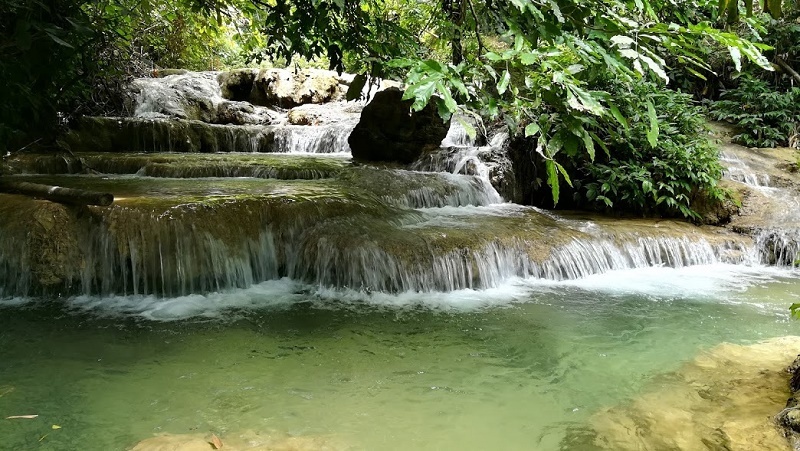 After breakfast, you’ll visit Ban Gioc Waterfall which sits on the China-Vietnam border, 85km from Cao Bang, passing through attractive scenery en-route. Ban Gioc is one of the largest and possibly the most impressive waterfalls of Vietnam. After a picnic lunch, you’ll visit Nguom Ngao, one of the largest caves in the area. It has many fascinating rock formations decorating the walls and the ceilings. 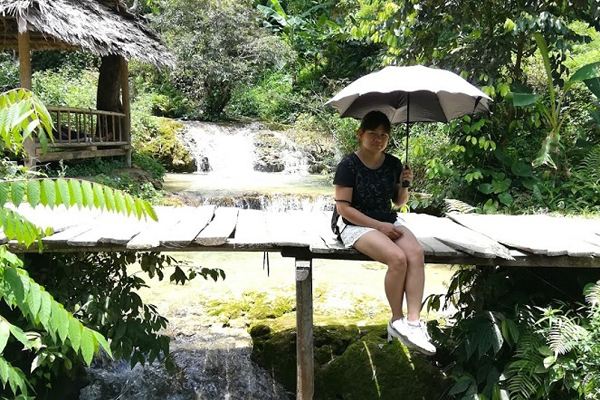 From there, you’ll head back to Cao Bang and then to Lang Son with time to relax before dinner. 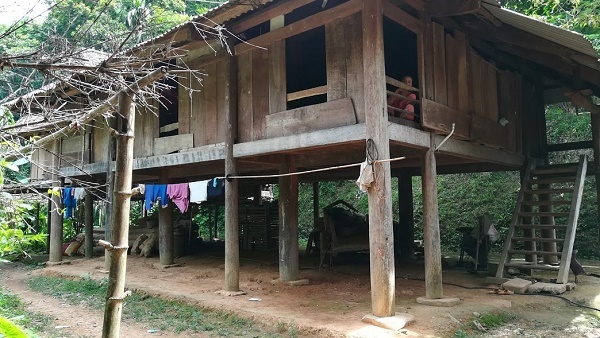 You will stay overnight in a hotel in Lang Son. After a four hour drive from Lang Son to Ha Long Bay. Upon arrival, you will embark on a boat where you can take in the magnificent surroundings and enjoy a delicious Vietnamese lunch. You sail past the main sights in Ha Long Bay, and in the afternoon set anchor to explore Sung Sot (Surprising) Cave. There will be time to kayak or swim and relax on deck whilst watching the sunset. You can enjoy a splendid dinner followed by drinks, karaoke or fishing, whichever you prefer. If you are an early riser, you can enjoy the incredible view of the sunrise over Ha Long Bay. You will travel by boat to Gia Luan Harbour on Cat Ba Island and then drive through Cat Ba National Park, enjoying the tropical flowers and trees along the way. From Ben Beo harbour, you will take a boat trip through Lan Ha Bay visiting Cai Beo Village, which is one of the oldest floating villages in Vietnam. You will check in at Monkey Island Resort and enjoy lunch in the beach restaurant. In the afternoon you are free to relax on the island or take part in any of the activities on offer such as kayaking or playing football or volleyball. If you wish to explore the island, there is a lovely walk up the mountain which offers fantastic views of Monkey Island and Lan Ha Bay. If you are lucky, you may see monkeys playing on the beach. You will stay overnight in a bungalow. If you like to get active in the morning, you can start the day with some beach exercises or a dip in the sea before breakfast. After breakfast, you will take a boat back to Cat Ba town and then a bus to Gia Luan Pier where you will board another boat back to Ha Long Bay. This boat will take you on a different route to the outbound journey, giving you one more chance to enjoy the amazing islets and dramatic scenery. Once in Ha Long Bay, you will drive back to Hanoi where your trip will end.